“Thoughts From A Unicorn” on sale now! 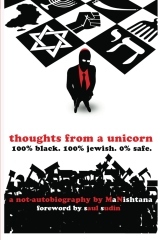 African-American and Orthodox Jewish blogger MaNishtana’s “not-autobiography” Thoughts from a Unicorn is a witty, straight-talking collection of memoirs, essays, and a few haikus that will take you on a journey of laughs, tears, self-reflection, learning, and peanut butter & jelly sandwiches. Full of insight, reflections on personal experiences, fond memories and honest regrets, this book will have you reaching for the tissue box sitting next to the pen and notepad you’ll want to keep on hand just to remember more than a few points. As any reader of his blog, www.manishtana.net, knows, his sharp humor cuts straight to the core of a matter. You’ll never be left guessing, but maybe wondering, at the end of each chapter. Preview the foreword with Amazon’s ‘look inside’ feature. Posted on Thursday, January 3rd, 2013 at 12:37 am. Filed under: New Work	RSS 2.0 feed.